How Many Logs Get Split? The amount of logs we split depends on the type of wood, size of the rounds and how small you want the logs to be. For that reason we charge by the hour for the whole service. The minimum time is two hours on site but usually people want us for longer so we can deal with a big pile of wood in one go. 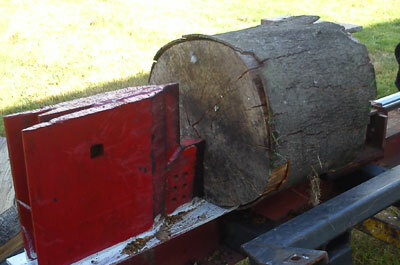 We leave the logs split for stacking or cover over, then simply tow the splitter from your freshly cut pile of logs. If you want them stacked we will need to allow extra time so there will be an extra charge for this. Using our log splitting service saves you time, effort, broken backs, axes and frustration. You still get the benefit of burning your own logs this way, but we take the hard work away. If you have a fallen tree that needs chopping up first then we can do this too – see our tree clearance page for details. Get in touch today by filling out our contact form.